We learned in middle school that current passing through a wire generates a magnetic field and that a magnetic field passing through a wire generates electricity. Later I learned that this is the basic principle of the transformer. 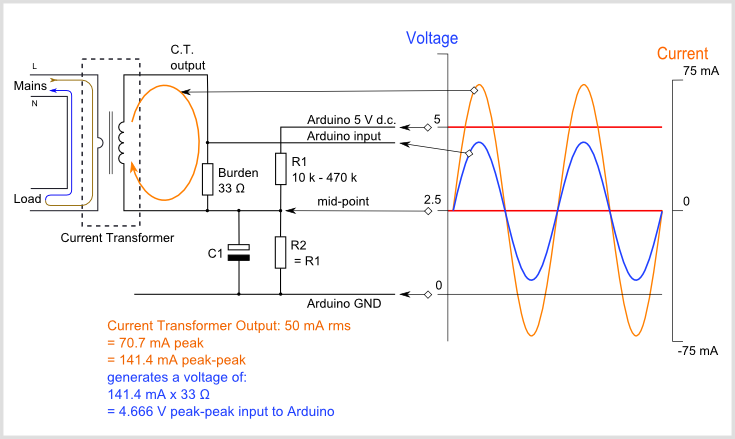 Our current sensor is essentially a transformer which generates a voltage across a burden resistor proportional to the current passing through the wire we are clamping the sensor to. Now we need to read the voltage from the sensor and do some calculations to determine the power usage. Since our voltage is AC, it has negative values and we would have to add a DC offset to it so the alternation would only happen above zero. Our microcontroller has an ADC which would convert the voltage value to a numerical value depending on it’s resolution. A 10bit resolution could have a value between 0-1023. Yeah, I am a fan of the ESP8266 microcontroller even though it doesn’t have the best ADC. Still, it has WiFi and works well with the Arduino SDK. Our sensor is rated 50mA on the secondary for 100A on the primary so we have 100 x 1000 / 50 = 2000 turns. Now the burden resistor should be chosen so that voltage doesn’t go over half of 3.3V: 3.3 V / 2 / 0.0276 A = 59.7 Ω This is close to 56Ω which is a common value so we can choose that. Took out the old scope and measured Vpp with various burden resistors and with all the major appliances running. ;) WTF is this?! Where is my sine wave?! Yeah, with all those reactive and non-liner loads (Fridge, TV, CFL and LED bulb, computers, etc) it will not look like a sine wave. 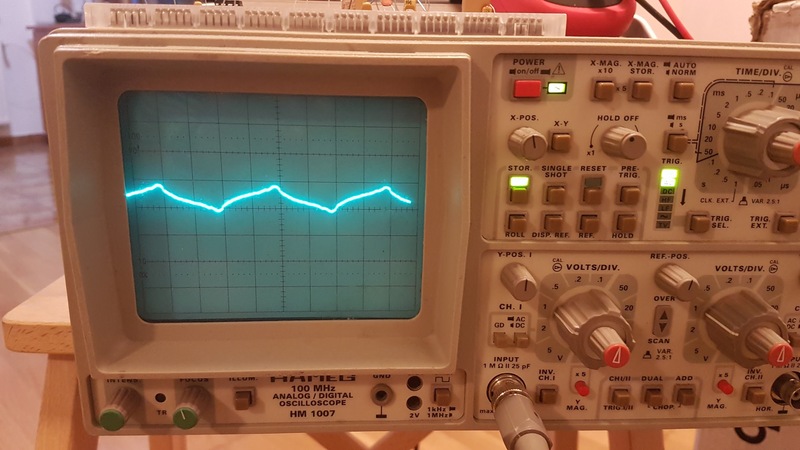 If I plug everything off and only run the stove or some other resistive load it looks like a very pretty sine wave but with normal devices, never. It seems that the sweetspot is 2 x 47Ω and adding all the running appliances sums up to ~6kW. I added a calibration feature in the Android app anyways and this way we could get slightly better results. 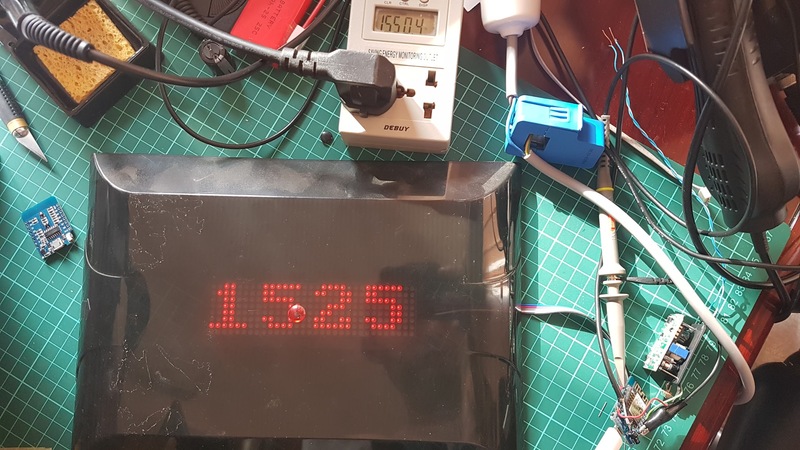 Here my meter is measuring 1525Wh and the commercial thing I have is measuring 1550Wh. The error margin is less than 2% so I’m happy with this result. We don’t know how well the commercial meter is calibrated anyways. The SDK we are going to use is Arduino and a bunch of libs that make things simple. Blynk will help us with the Andorid app and communications through Internet. ArduinoOTA will allow us to do wireless firmware updates. MAX7219_Dot_Matrix is obviously the lib which paints the display. 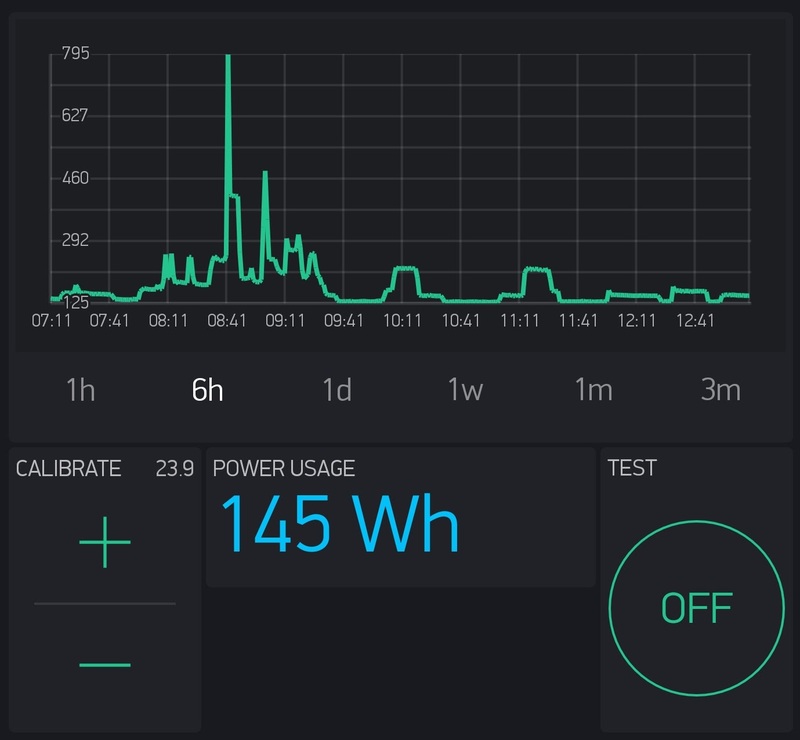 EmonLib does all the math for energy monitoring. The ESP8266 has a single 1V, 10bit ADC built in. This isn’t great if you want precision. Using an external ADC such as ADS1115 would allow us to go to 4 channels, 5V and 16 bit. It would be a huge step up and just a small increase in cost. I'm a guy that understands technology, enjoys listening to music, building things once in a while and couldn't care less what's trending on Facebook.